This has been mentioned before but has not been added to the compiled list of suggestions and has not been mentioned in Licensing Suggestions yet. 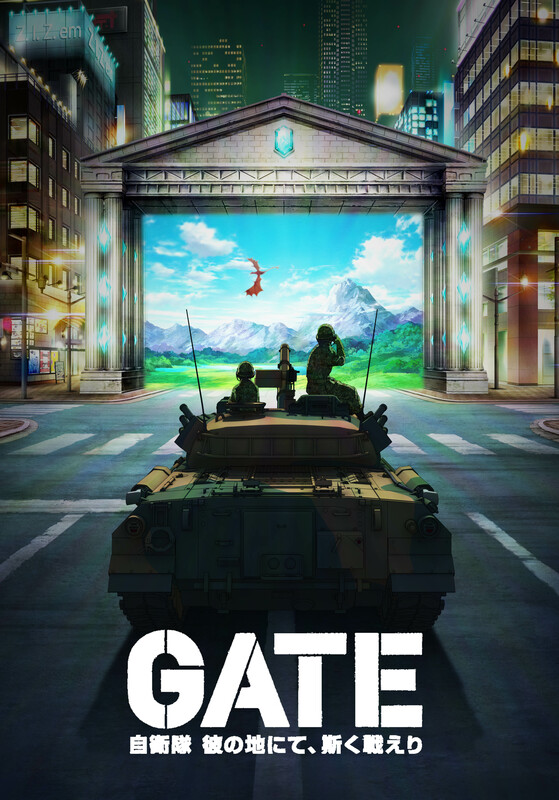 Name: Gate: Jieitai Kano Chi nite, Kaku Tatakaeri! Volumes: 10 (Complete) or 5 (Complete) There were 2 releases in Japan where the second split the books into 2 parts. Plot: One day a gate opens up in the middle of a downtown shopping area in Japan and an army of goblins, orcs, trolls, knights, mounted wyverns, and more come out and start slaughtering shoppers. The police respond and are assisted by an otaku who is an off-duty JSDF member to save as many as possible. Through the efforts of the JSDF and the local law enforcement they manage to end the invasion. Then the JSDF sends forces into the other world to establish a foothold there and prevent such a massacre from happening again. They send out scouts (including the off-duty JSDF member that saved so many people in the first incident) to obtain more information about the land, it's resources, and political structure. There is an Anime of this series available on multiple licensed Anime streaming sites. The Manga has been licensed by Sekai Project. They have released the first volume years ago (but it is out of print) and the second volume is supposedly coming out "soon". They have a release date listed in either May or June of this year but I don't remember what it was. The Light Novel has not been licensed by anyone to my knowledge. There is a fan translation of the first half of it but I will not link it due to questions about the legality of it since I do not know if they obtained permission to distribute a translation of it. According to a site that aggregates links to fan translations, it has been several years since an update has occurred. The Anime ends well but it definitely leaves open loose ends. It is one of my all-time favorite Animes. The Japanese voice actors did a really great job representing their characters. I really want to know what happens next. Edit: changed the number of volumes to 5 or 10... I was mistaken on how many there were. I've watched the anime and I checked out the manga scanlation. I wasn't aware that the LN is actually complete so that's good to see. Too bad that the publisher is Alphapolis so there's little chance for JNC to be able to license it. I wasn't aware that the LN is actually complete so that's good to see. It actually has a second series with, I think, all new characters. I love alternate history with technology gap stuff, so combining that with an isekai was just delightful. Modern military in a fantasy world? Yes please! I might be wrong. It could be 5 or 10 books after doing some research. Not counting any after story books Like the one about the JSDF Navy branch getting involved in the other world. @syko You can buy the light novels and manga in Japanese on bookwalker and get a digital copy of it you can access through their app. The Manga actually is licensed by Sekai Project but some people are not happy with how they are releasing this. Loved the anime and read the unofficial TL until they stopped. Would happily buy this. I would definitely buy this as well. It was originally released as 5 novels. The reprint was done as 10 books (5 "top" 5 "bottom") for the small softcover format. There is a second series of 5 novels (10 top/bottom printing again) that is basically 1 novel per girl that gives a lot more background story to each of them and their world. I would love to read this, I cannot remember how well the second series of light novels is going, but the 1st series was definitely enjoyable and continued where the anime left off. I know there was a lot of pro-Japan and its military, but its nothing different compared to Hollywood promoting the US military extensively. I do love the concept of medieval or ancient world vs a modern military and it certainly shows it well. The second season has a third volume scheduled. @terrence Yet another reason why I need to buckle down and resurrect my Japanese studies. So I can finally start reading books like these. I am sure though I would have a hard time with the cultural references since I don't live there nor watch much of their media. The whole reason I started seriously looking at LNs! So yeah I'm glad to see others want it to.